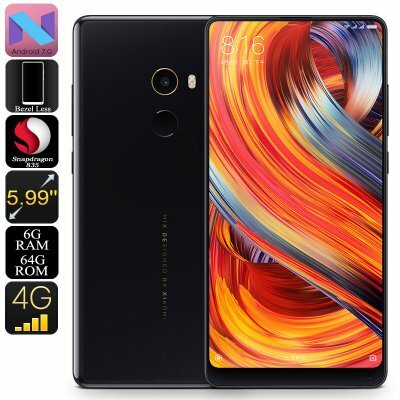 Successfully Added Xiaomi Mi Mix 2 Android Smartphone - Android 7.0, 5.99-Inch Bezel Less, Bluetooth 5.0, 6GB RAM, Snapdragon 835 CPU (Black-64GB) to your Shopping Cart. Take your smartphone experience to absolute new heights with the Xiaomi Mi Mix 2. With their latest Android phone, Xiaomi has once again managed to blow our minds. It comes with a revolutionary 5.99-Inch display that features an unbelievable 93% screen to body ratio. Thanks to this, your smartphone is almost entirely bezel less. This bezel less display is guaranteed to treat you to a stunning and endless visual experience while using your phone for enjoying your favorite media. To increase your user experience even further, it treats you to Ultra-HD 2K resolutions. With this stunning display at your side, you’ll be able to undergo a cinematic experience no matter where you’re at. Besides offering breathtaking visuals, the Xiaomi Mi Mix 2 simply looks stunning on its own. With its ultra-thin design and massive screen, it surely is a feast to look at. Naturally, this smartphone has much more to offer than merely its looks. Inside, it packs the latest hardware that brings forth an extremely powerful performance. With its Octa-Core Qualcomm Snapdragon 835 processor at 2.45GHz and 6GB RAM, this smartphone can tackle the most demanding software without dropping a frame. You’ll be able to enjoy films, games, and Apps without ever slowing down your device. With 64GB internal storage, there is plenty of space for you to keep your files and media. With Dual-IMEI numbers, 4G, and Dual-Band WiFi at your disposal, you’ll be treated to ultimate connectivity. The Xiaomi Mi Mix 2 lest you insert two SIM cards and stay connected to both at the same time. Additionally, 4G and Dual-Band WiFi lets you browse the web at lightning speeds no matter where you’re at. With Bluetooth 5.0 support, you’ll even be able to share files and data at stunning speeds in between different devices. In order to let you take the most out of all the features this latest Android phone has to offer, it comes with a powerful 3400mAh battery. This cell lets you use your phone for 8 hours straight without needing to recharge. For all mobile photography lovers among us, the Xiaomi Mi Mix 2 comes with a 12MP Dual-Rear camera. This snapper lets you shoot breathtaking images and video in 4K resolution. With this smartphone camera at your side, you’ll be able to take your mobile photography to the next level. Whether you’re enjoying an evening out with friends, attending a birthday party, or are traveling abroad – from now on you’ll always be able to snap the perfect picture. The Xiaomi Mi Mix 2 smartphone comes with a 12 months warranty, brought to you by the leader in electronic devices as well as wholesale Android phones..